Nearly two weeks without it. The jackhammer has driven me mad, and I retreated to the play room and have painted up a squad of AVBCW, some characters and scenery. Camera and light levels not playing ball tonight though so will provide a much overdue update on my own painting tomorrow. 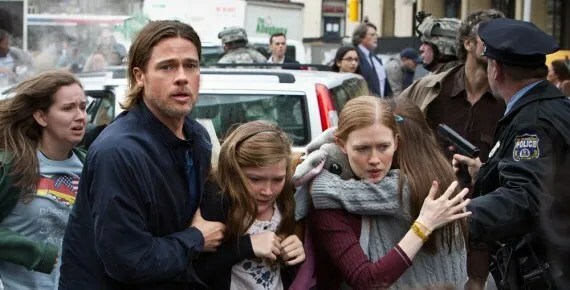 World War Z allegedly based on Max Brooks’ book of the same title. Its an average film. 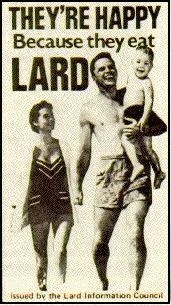 It’s a series of set pieces hung together with a wafer thin plot that references Brooks’ ideas. Brad Pitts’ character is barely defined, as is his family background which is barely emotive. The plot leaves out huge chunks and its only if you have read the book do you understand it. If he doesn’t go on the mission, then his family get kicked off the USN ship (nice). His background is alluded to but not played out. His boss the UN guy is barely described let alone fleshed out. Having read the book, its frustrating that none of this background is described even in deux ex machina style. 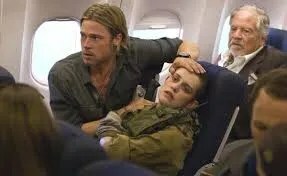 The zombies and the plague are incoherently described, and for one reason or another Brad’s character (I can’t even remember the names after watching it twice in as many nights) ends up in Wales with an injured Israeli conscript – fair do-s the Israeli section is well explained and much in keeping with the book. This section of the film is good and coherent, even if somewhat mundane when compared to The Walking Dead, much better edited and explained and brings the film to a better conclusion than could have been anticipated from the previous hour of grandiose but incoherent set pieces. Tighter editing and writing would have served this film better. A so-so film that holds promise. If there is a sequel as is mentioned, they could do with a better editor. For the idiots, here’s a critique of The Walking Dead, spot what is wrong with it. Hot on the heels of the zombie arguments from the climate change deniers, here’s a review of The Walking Dead, Season 3. As you can see from the montage of mugshots, there are a few new faces, and a few missing faces. After Season 2 which was very slow up until the rather violent ending, Season 3 starts as it means to go on – the walkers/biters are far more frequent and they are the least of Rick’s worries. 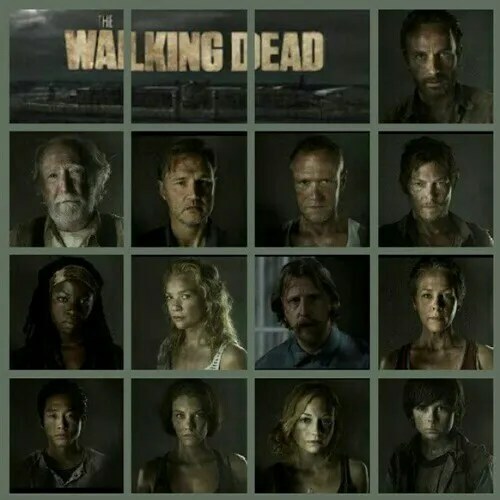 Establishing themselves in a prison with its sturdy wire fences and watchtowers, and dealing with most of the remaining prisoners, the series switches to Andrea, her saviour Michone and the community of woodbury lead by The Governor. 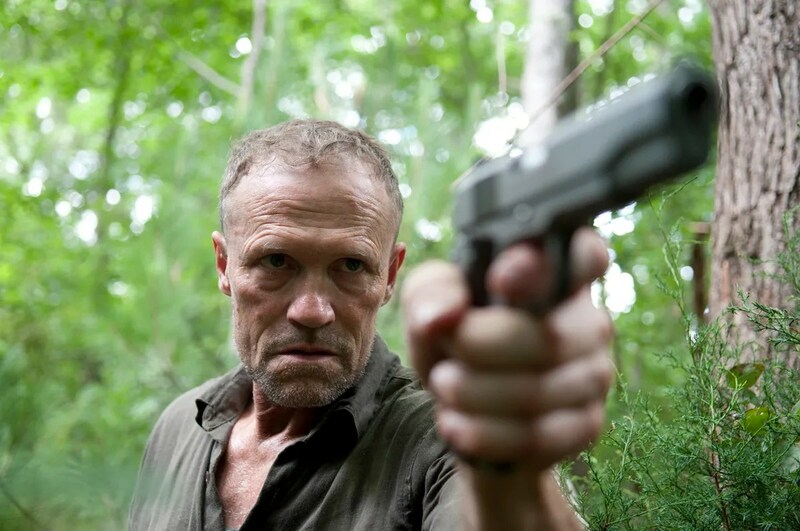 Michone is immediately wary of him, not least because Merle is one of his henchmen and pulls a gun on the pair of them. Merle is less than impressed when Andrea talks to him, but they both bond over the fact that Rick’s group left them for dead (in both cases that is false but hey neither of the characters believe that analysis). Michone leaves town the hard way, retrieving her katana, finding the Governors collection of live and dead heads in fish tanks (yeah, lovely) and then hooks up with Rick’s group though Rick is very reluctant. He’s already kicked out one other group of stragglers. 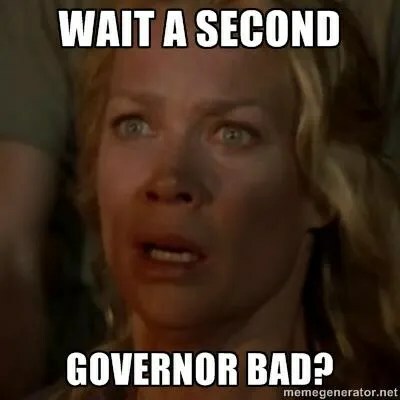 Angela, with Milton have uncovered the Governor’s antics are beyond the pale. Both take covert actions to try and patch things up with Rick’s group and Woodbury. Both fail, both are caught and set upon each other by The Governor, as are Merle and his brother Daryl after Rick’s group raid Woodbury to rescue Glenn and Maggie who were captured. The season ends with a big shoot out as the Governor attacks the prison, is driven off and goes mad shooting his own side, the survivors joining Rick’s group. That’s a very brief synopsis of the plot, but what did I think of the series and other things I didn’t mention ? Lori: I commented that Lori was a very unsympathetic character in Season 2. Well she gets it in Season 3 – and in a horrible way that made me almost feel sorry for her. She dies in childbirth as Maggie, Carl and she are escaping zombies. Rick: He starts seeing and hearing Lori after her death and almost ignores his new daughter (born by c-section performed by Maggie). Some people might think this is far fetched – sorry No, been there seen it done it with the Late Queen In Yellow. But this undermines his self-faith and he abdicates responsibility at the end of the season. A bit disappointing but I can understand. Carl: Both growing up fast when he locks the stragglers out, but worrying when he shoots a surrendering Woodbury soldier. Herschel: Loose the pony tail ! 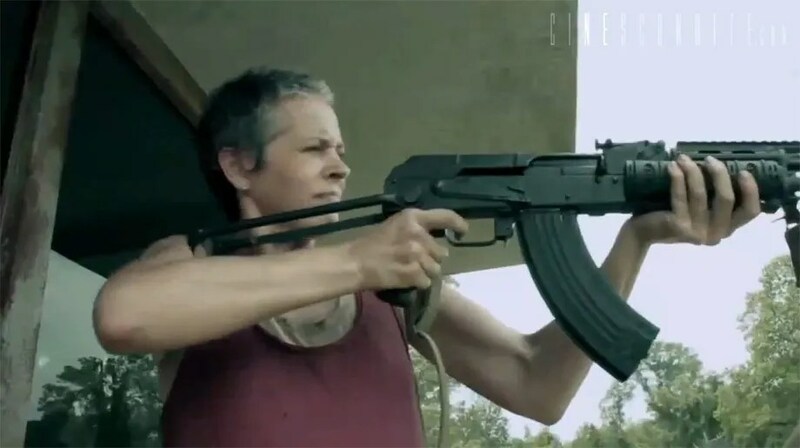 Carol: Comes out fighting ! She’s turning into a very interesting character. I hope she doesn’t get killed off in Season 4. Other than those character notes – this is a much more action packed season. 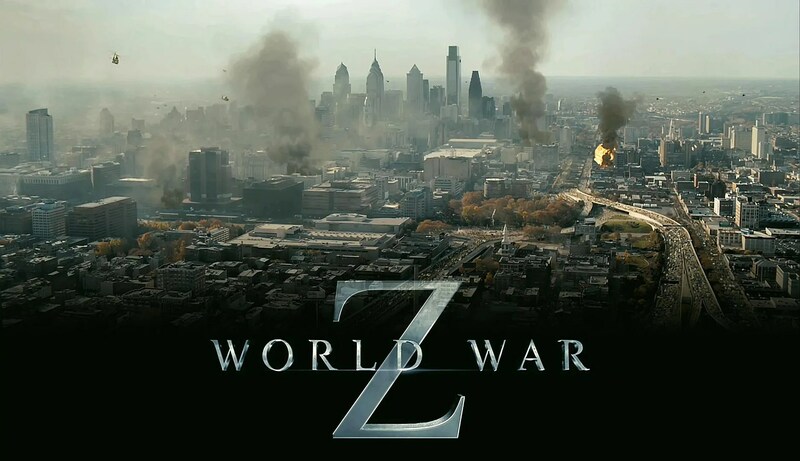 Character development is in no way ignored but there are a lot more zombie incidences along the way, and the tension between the surviving groups is great. Fights over supplies are inevitable in any post apocalyptic situation. Quite by co-incidence a shortly after posting about the excellent initiative by Science to promote access to proper scientific papers to (US) school students, a colleague in the war against the unscientific drivel gpwayne posted on his blog about how the Heartland Institute was sending letters to US Teachers promoting their own publication the NIPCC which is the usual gish gallop of wishful thinking, handwaveium, unobtanium and outright unscientific assertions. Needless to say, the open letter he wrote highlights the multiple lies they are pedalling, and illustrates how this organisation has a track record such as denying smoking causes lung cancer and sponsored bill boards equating climate scientists with serial killers (charming, but unscientific). As emphasized in the SitC Teachers’ Guides, each paper is designed to be used to illustrate general points about the way that science is done and the nature of scientific communication. Thus the exact topic covered in class is less important to us than the fact that students will be exposed to an authentic science paper and learn how the authors use evidence to derive important new understandings. Which is what science is about – not starting from an ideological view of the world but collecting and understanding the facts, and then proposing the underlying mechanisms and expressing them in theories and hypothesis to derive established science. JP on his blog Hereford 1938 has written up his account of the games on Saturday. Complete with his own pictures ‘cos he got a new camera ! 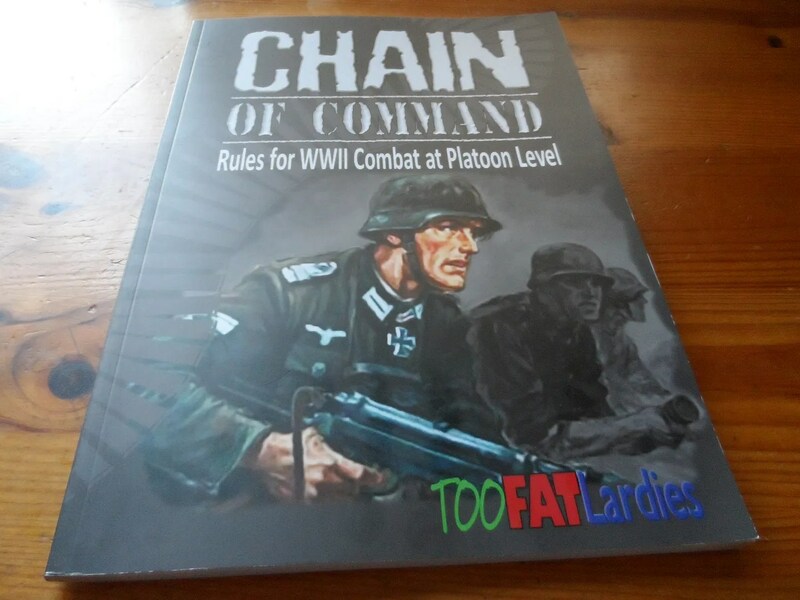 So JP and I tried out yet another skirmish rules set: Chain of Command. JP had bought this recently for his b’day and wanted to try it out. 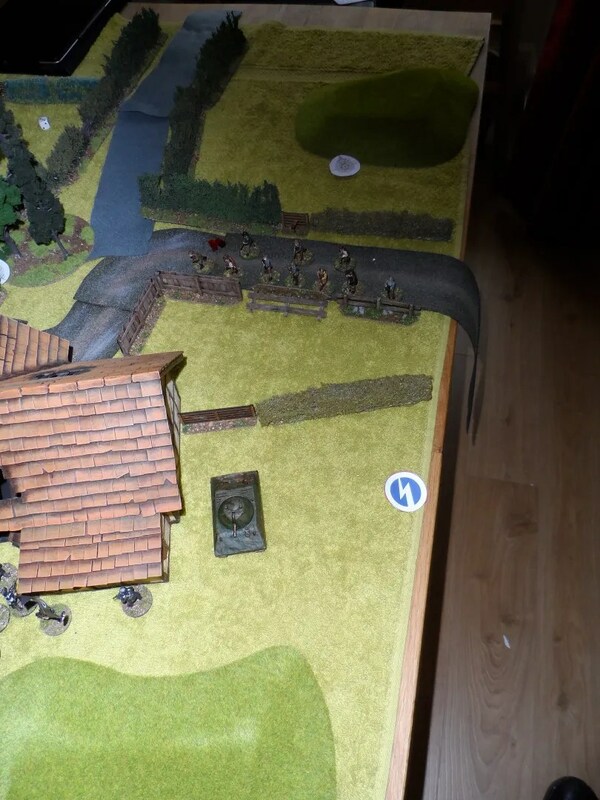 I failed in an assignment to pop round and pick it up, so other than a two page concoction from JP, and a barely understood viewing of a you tube video of the two fat lardies explaining it (the words were all English but made little sense to me) I turned up to engage in battle. The hard copy is a decent sized glossy affair as is rapidly becoming standard for most mainstream genre rule sets. Sadly AVBCW being very much niche can’t afford to pay for the high production values and extra taxes that come with this level of publication (I’ve asked about this before and had it explained, so no disrespect to niche publishers !). 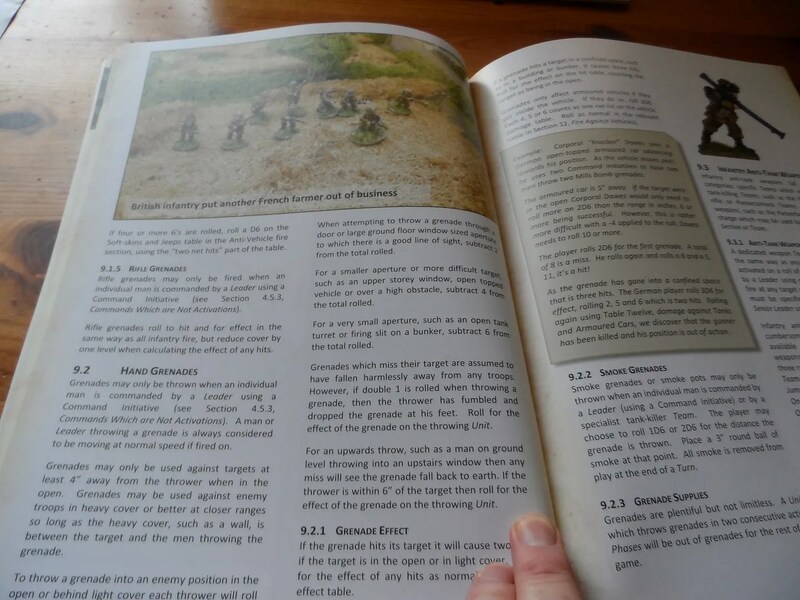 Ok, so its a glossy book, but how do the rules play ? 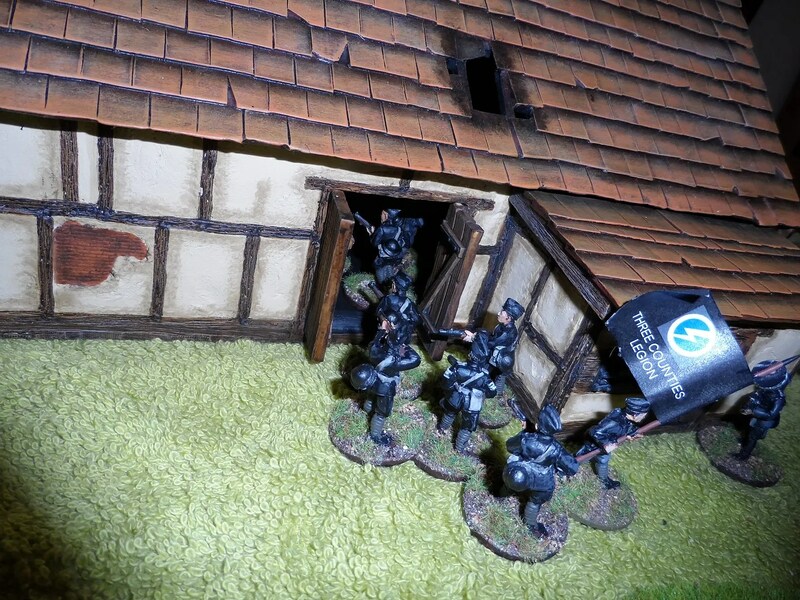 We only did the Patrol scenario (the basic engagement encounter), but it turned out to be a quite innovative affair. 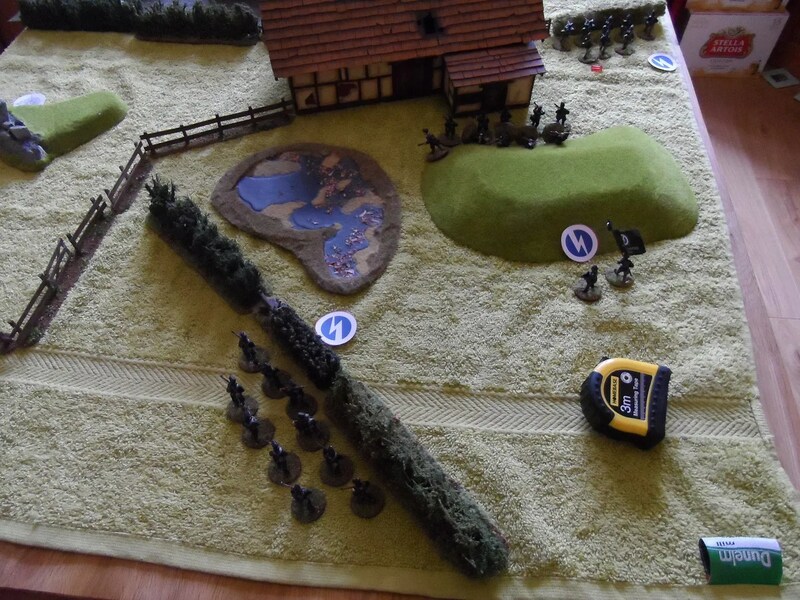 After working our your Forces, their skill level, and Force Morale, you work out where you start on your side of the board, and then start deploying patrol markers up to 12 inches away from each other in a chain. You can’t get within 12 inches of the enemy, and if you do you are “locked down” so this represents patrols randomly encountering each other. 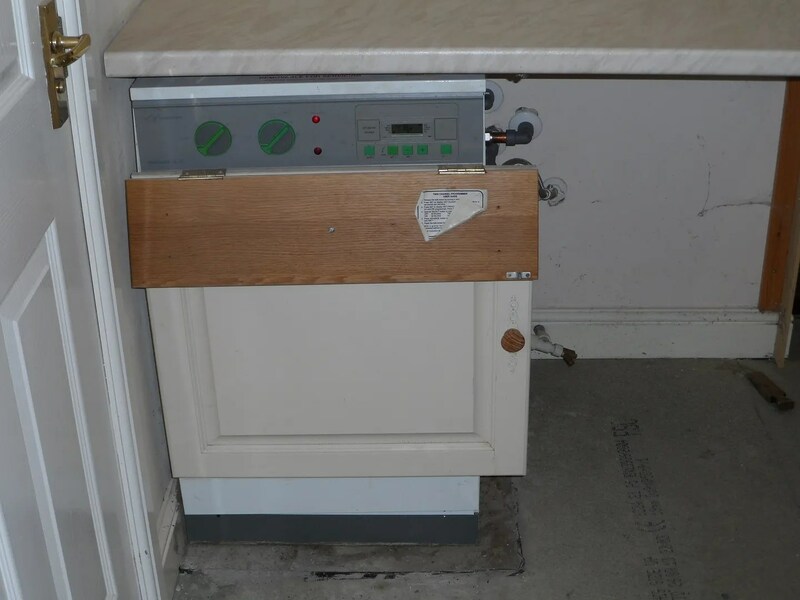 So there is no hard and fast “deploy 12 inches from the board edge” type rules ! 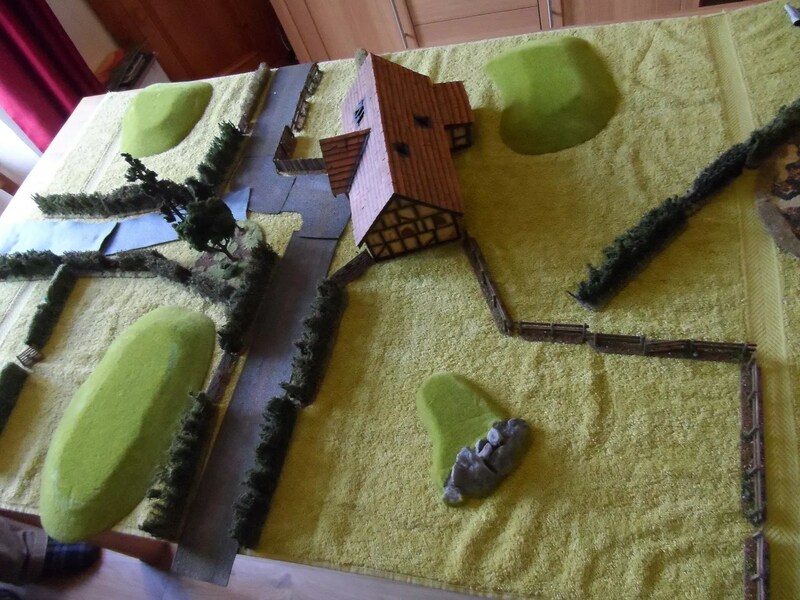 This can radically alter the tactical set up of the board and deployment. The force with the higher morale goes first and rolls a number of dice dependent upon their morale – between 4 and 6. This is for a Phase. This can determine which/how many units may be “activated”, whether you get to go on another phase, whether you accumulate Command points and so on. I won’t re-write the rules here ! In our games, JP had a knack for going two phases one after the other which did leave me standing idle and it is a bit more of an IGoUGo (heavily modified !) system. By accummulating Command points you can end the Turn if you want, which removes lots of makers and effects such as smoke. However, in the two games we played, we only ended one turn, so I anticipate players reducing the number of Command points needed to end a Turn. Different leaders have different numbers of Initiative points, so having leaders in the right place and getting the right dice rolls is important. We also both found that we would have to radically alter our tactics for this rules system. Weapons ranges in this game are LONG. Pretty much Line Of Sight (LOS). So unlike other rules sets, getting up close and personal is a suicidal act with lots of casualties, huge amounts of Shock, and a good way to rout. Shock represents troops going to ground and generally being demoralised. Actual deaths are low, but a hail of bullets is just as effective in driving off the enemy – again a built in aim for the rules. Its similar to duckback rules, and also influences being Pinned. Firepower is awesome, with LMGs on 6 dice to hit, HMGs on 10 dice to hit. As in real life getting caught in the open by an HMG leads to a short life expectancy. With a “To Hit” roll, followed by a “To wound” roll it seems old school, but what they’ve done is to modify the “To Hit” rolls by using both firers’ skill level and the targets’ skill, and also on the “To Wound” roll making it much better IMHO. 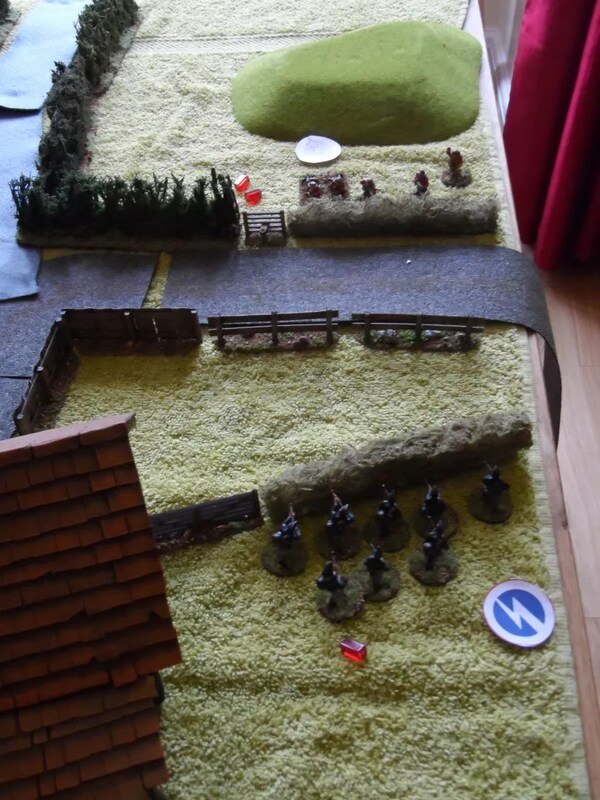 So Regular troops utilise cover more effectively than Greens. Key Question: Did we have Fun ? Yes ! The deployment/Patrol phase I found very innovative. The Activation rolls innovative – even if I think I got the sticky end of the stick. As commented I’d reduce the number of Command points needed to end the Turn. 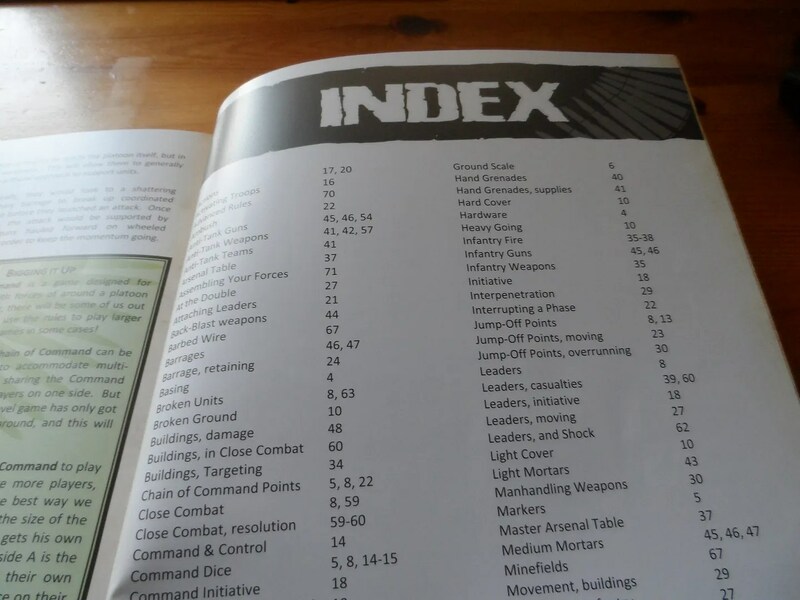 It has an Index ! A key rule – Force Morale – is not explained very well IMHO. Its an excellent mechanism but could do with a revised section on it as the overall mechanism is scattered throughout the rule book. Looks like I’m buying yet another rulest – the copy in the pictures is borrowed from JP. Obviously designed for WW2, this can easily be adapted for AVBCW, and probably also RCW where morale was very important. 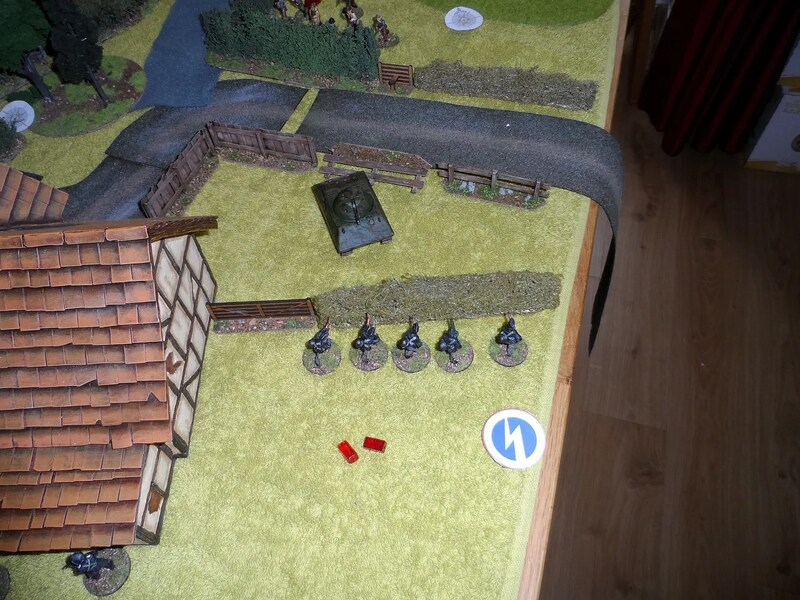 For our second game of Chain of Command, we re-arranged the table, and added the em-4 barn. 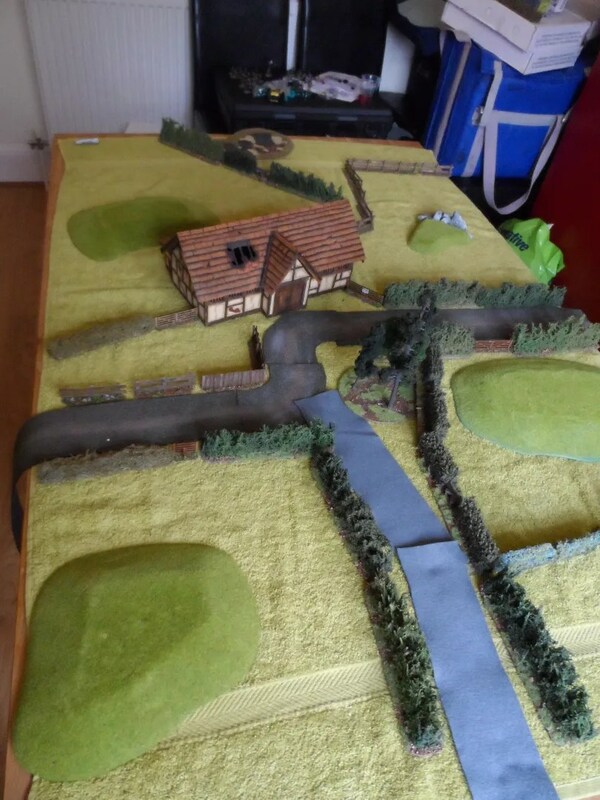 Old farmer Arthur Webley has been clipping hedges, but he’s also been clipping some of the gun runners of their goods as payment to cross his land. As a result he’s amassed a goodly load of weapons. Both the BUF and Anglican League don’t want these weapons falling into the wrong hands. We commenced the Patrol phase. My BUF deployed well I initially thought. 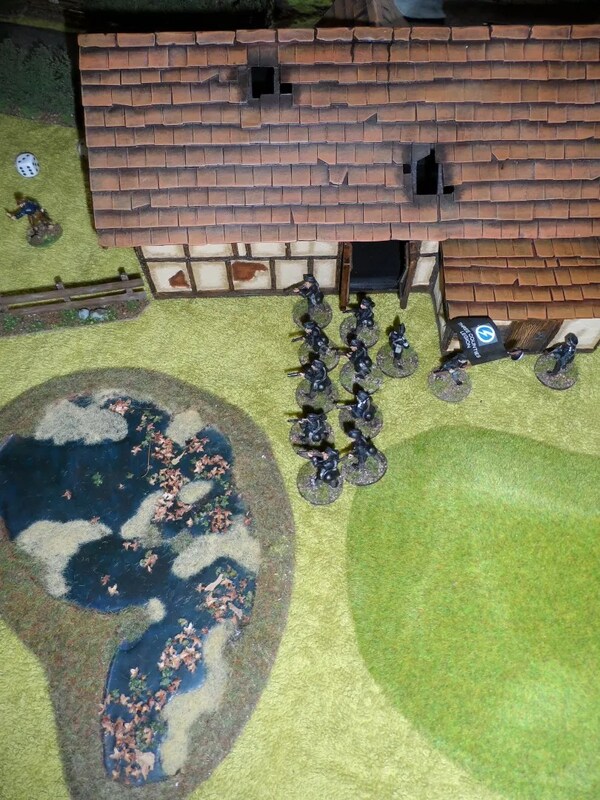 JP’s Anglicans popped up very close and a ferocious firefight ensued. 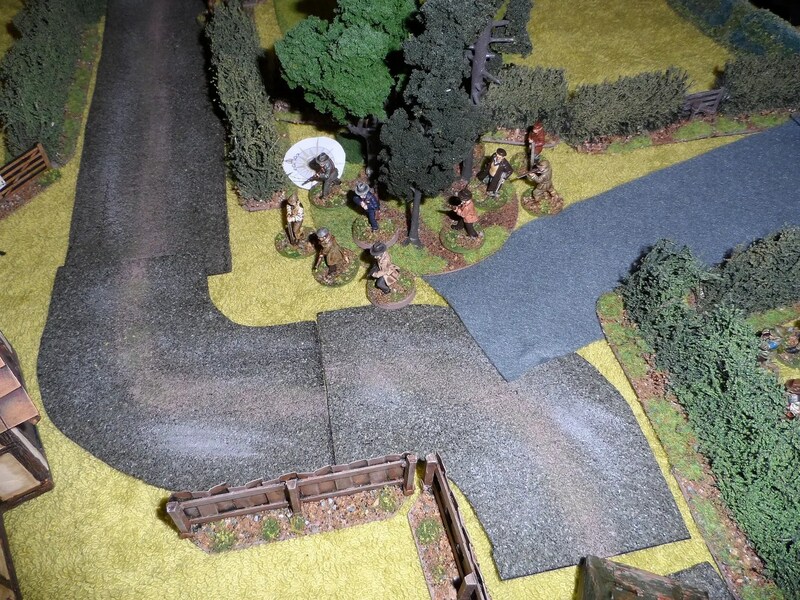 Then JP deployed his tankette – he had subtley altered his army list. 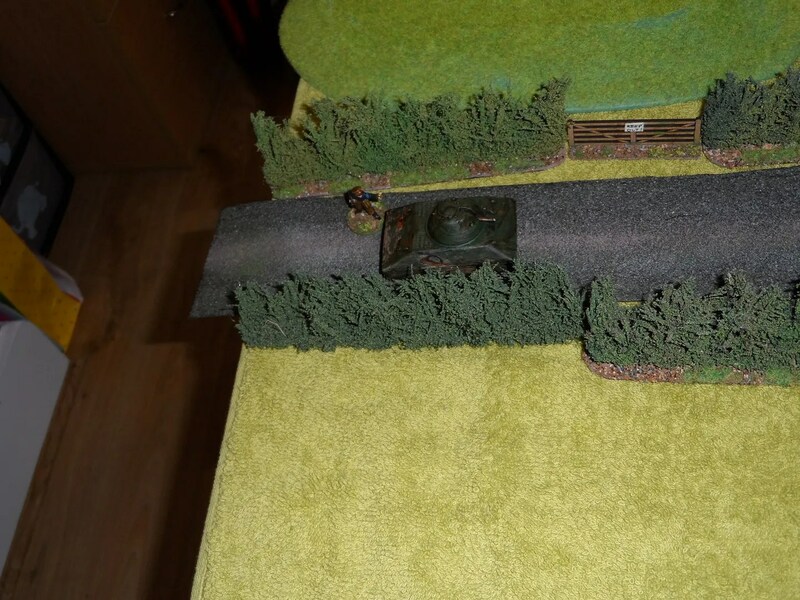 And brought the tankette up, which was armed with an HMG (10 shots…). Unsuprisingly having finished off one of his units, damaged a second but with no way of harming the tankette, my regulars made a quick sharp exit ! 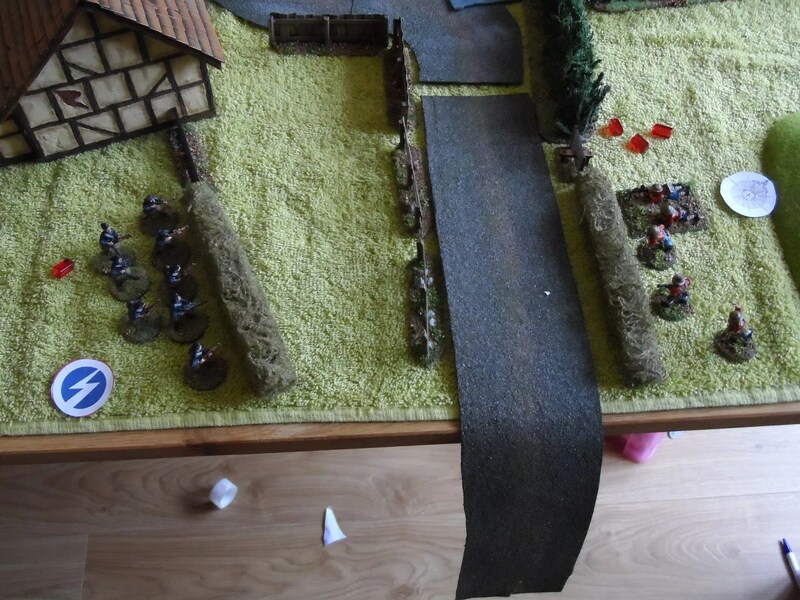 This left that flank undefended, and my jump off points exposed. 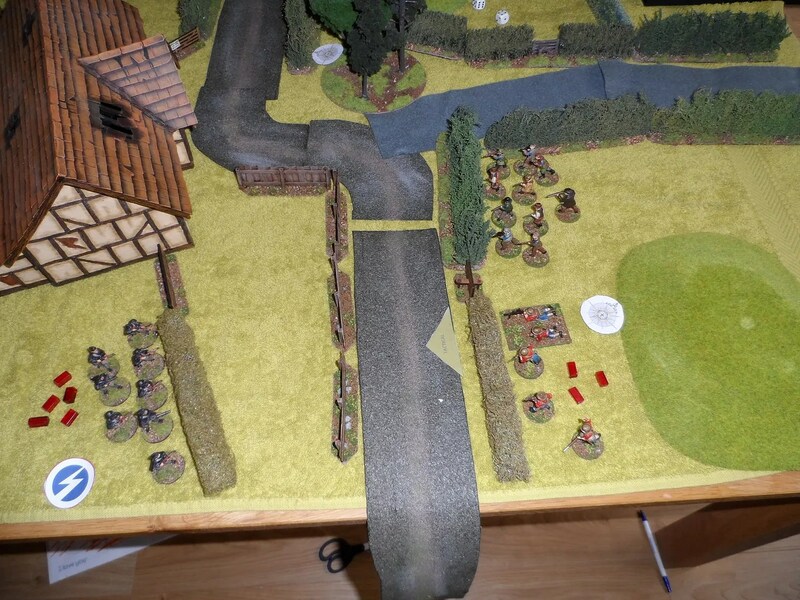 …because my thrid section on my left flank got caught out be an impetuous advance by his third unit who wiped them out in two rounds of shooting. 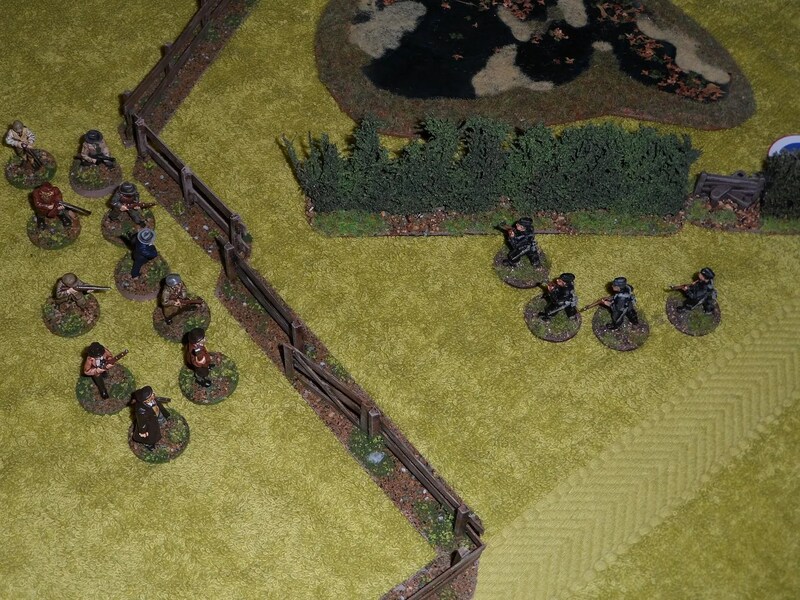 Even pulling the central unit out of the barn and forming a firing line couldn’t save them. The tankette was now coming round behind the barn. This left my central section trapped in a pincer movement, with no escape routes. I therefore conceded the game. I had lost because I ahd become fixated with the barn, and by entering it had effectively (as Jp put it) taken a section off the board. In this set of rules, and probably most others you need your troops shooting, not marvelling at architectural excellence ! Occupying terrain features is one thing, driving off the enemy is more important. Other lessons learnt will be in the next posting on the rules. We resolved to run our next game, with the BUF holed up in the barn needing to be rescued.